Sweet peas are such delicate flowers and so beautifully fragrant, it’s hard to believe that they’re also tough as old boots. In fact, you can sow sweet peas right now and leave them all winter and they’ll come to no harm. Sown in autumn, these annual climbers will flower earlier than ones you sow in spring and often end up being better plants, having had extra time to develop a bigger root system. They’ve got everything they need to produce lots and lots of gorgeous, scented flowers for picking throughout the summer. All you have to do is start the seed off in free-draining sandy compost and then keep them in a well-ventilated cold frame or cold greenhouse over winter. If the weather gets really chilly with prolonged frosts, cover with lagging, but in a mild winter you shouldn’t need to bother. Use deep pots so the roots have plenty of room to head downwards – sweet peas like a deep root run. Deep module cells, recycled toilet roll tubes or Rootrainers (plastic modules that open out like a book to avoid disturbing the roots) all work well. Whichever you choose, simply fill the pots with your compost, leaving 2cm (1in) at the top. Sow two or three seeds into each one, top up with compost so they’re full then water them in well. They’ll need a bit of watering over the winter months to stop them drying out, but not so much that they’re permanently soggy. Unlike spring-sown plants, which can be leggy, autumn-sown sweet peas shouldn’t need pinching out because they tend to bush and branch out as they grow. Follow up your autumn sowing with a couple more sowings in early and mid-spring and you’ll be able to pick and enjoy sweet peas for even longer. 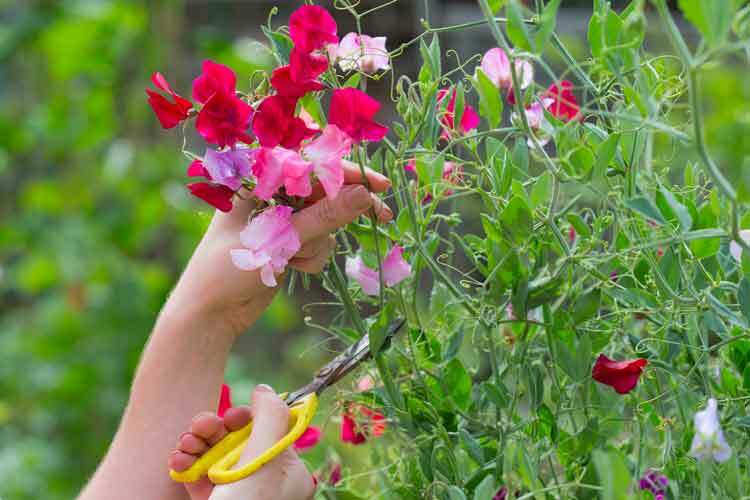 If you like to pick sweet peas the house, sow varieties with long stems. I don’t think you can go wrong with ‘Spencer’ types such as lavender-flushed ‘Percy Thrower’, ‘Gwendoline’, a lovely pale bubblegum pink or ‘Robert Uvedale’, an intense magenta pink that was new this year (find these at Mr Fothergill’s, 0845 371 0518; www.mr-fothergills.co.uk). A deciduous shrub with arching stems and fascinating pendent flowers – white with deep wine-red bracts. Dark purple berries follow in autumn. The same habit and flowers, but beautiful yellow foliage and new growth is flushed orange. Grow in full sun or light shade for the best colour. Enjoy a vibrant garden whatever the season!